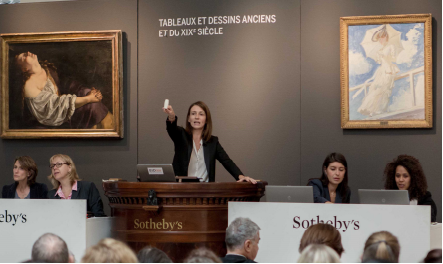 Sotheby’s Paris sale of Old Master & 19th Century paintings and drawings on Thursday last week was a runaway success, bringing in a total of €8.2 million ($11.1 million): the highest sale total ever achieved in this category for the last 20 years in France. The afternoon’s highest price went to a newly-rediscovered work by Artemisia Gentileschi, pushed by seven bidders to €865,500 ($1.175.211) – a world auction record for the artist. This Baroque work, in excellent condition, was an important rediscovery made by the Paris Old Master Department in an age-old collection from the south of France that enabled this Caravaggesque portrayal of Mary Magdalene in Ecstasy to re-emerge in public after being hidden from view for 80 years (lot 24, est. €200,000-300,000). France (lot 114, est. €100,000-150,000). A number of other world auction records were set during the sale, led by the €529,500 ($718.976) paid by the UK trade for an attractive Portrait of Elisabeth de France by Frans Pourbus the Younger, a portraitist of genius (lot 12, est. €60,000-80,000).